A Full featured rich text editor in your application in seconds! Don't overwhelm your users with "everything and the kitchen sink" editors that confuse and frustrate your visitors and take forever to load. Good things really can be free. 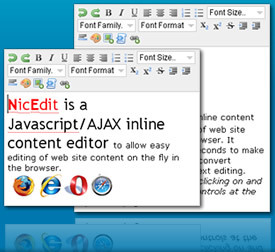 Customize your copy of NicEdit and get started editing anywhere today! Need help implementing NicEdit into your site? Need custom buttons or functionality? Visit the forums In addition to the forums you can contact the developer of nicEditor who is available for hire. All textareas on the page will be converted to nicEditors. Note: this project is not actively developed anymore, but will continue to operate for existing users. A minor release to fix several bugs in NicEdit 0.9.